Those words amounted to perhaps the most caustic insult that Trump has publicly hurled at another American since taking office, going beyond his usual name-calling and flame-throwing. Trump labeled MSNBC's "Morning Joe" as "poorly rated" and its hosts "low IQ Crazy Mika" and "Psycho Joe." The first tweet contained the typical name-calling fare from President Donald Trump, the kind of attacks that no longer surprise most people - labeling MSNBC's "Morning Joe" as "poorly rated" and calling its hosts "low I.Q. Crazy Mika" and "Psycho Joe." But the second tweet, landing about six minutes later, caused an immediate and sustained uproar, as it contained a deeply personal and vulgar attack on Mika Brzezinski. 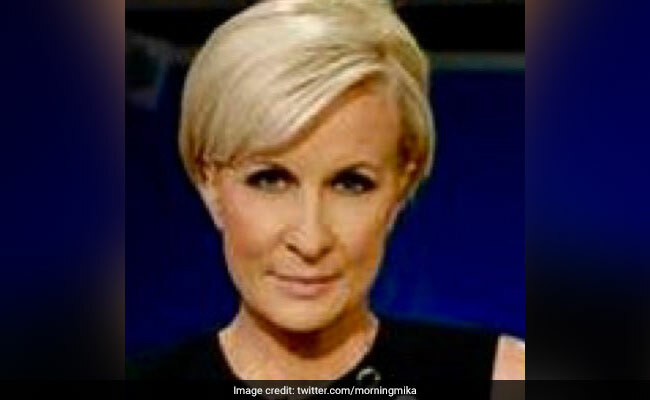 "She was bleeding badly from a face-lift," the president tweeted Thursday morning, claiming that months earlier, Brzezinski and co-host Joe Scarborough tried to spend time with him at his private club in Florida. "I said no!" Those words amounted to perhaps the most caustic insult that Trump has publicly hurled at another American since taking office, going beyond his usual name-calling and flame-throwing. More than three dozen Republicans and Democrats in Congress issued tweets of their own expressing disgust, calling the remark "unpresidential," "vile, sexist and unbecoming of an American leader," "divisive," "unhinged and shameful" and "amazingly graceless." Even some of the president's close allies warned that he needed to act like a president and stop getting into distracting fights. And by going after a powerful female journalist's appearance and mental health, Trump not only distracted the country from his legislative agenda for a full news cycle, but also added yet another data point to the argument that he treats women differently from men. "It is really not normal that the president of the United States and the commander in chief would be tweeting about somebody's face," said Liz Mair, a longtime Republican strategist and critic of the president. "It does not conform with the norms that we expect and we treat as pretty set in stone in this country, but it's also just strange." Trump's staff quickly came to his defense, saying that Brzezinski and Scarborough have said far worse things about the president and his staff. "Look, I don't think you can expect someone to be personally attacked day after day, minute by minute, and sit back," deputy press secretary Sarah Huckabee Sanders told reporters at the White House. "Look, the American people elected a fighter. . . . They knew what they were getting when they voted for Donald Trump." Trump once had a chummy relationship with "Morning Joe," regularly calling in for lengthy interviews, referring to Brzezinski and Scarborough as "supporters" and offering to officiate at their wedding. But the hosts have become increasingly critical. For months, Brzezinski has raised questions about the president's psychological health, calling him "possibly unfit mentally" and saying that he is "such a narcissist, it's possible that he is mentally ill in a way." On Thursday morning, Brzezinski said that if someone took over NBC and acted as Trump has - "tweeting wildly about people's appearances, bullying people, talking about people in the competition, lying every day, undermining his managers" - that "there would be concern that perhaps the person who runs the company is out of his mind." Sanders pointed to such rhetoric in her defense of Trump. "The things that this show has called him - and not just him, but numerous members of his staff, including myself and many others," Sanders said. "It's kind of like we're living in the Twilight Zone. They do this day after day after day, and then the president responds and defends himself, and everybody is appalled and blown away." Later in the day, Sanders's father, former Arkansas governor Mike Huckabee, said in a Fox News Channel interview that the president "makes my daughter's job very difficult with tweets like that." Less than half an hour after Trump fired off the tweet, Brzezinski responded by tweeting a photo of a Cheerios cereal box including the caption: "Made for Little Hands." The message seemed to be aimed at mocking the size of the president's hands - a sensitive topic for Trump that has dogged him for decades and even came up during a GOP presidential debate. Mark Kornblau, the NBC Universal News Group's senior vice president for communications, tweeted: "Never imagined a day when I would think to myself, 'it is beneath my dignity to respond to the President of the United States.' " The company later released a statement saying: "It's a sad day for America when the president spends his time bullying, lying and spewing petty personal attacks instead of doing his job." The tweet marked a new low in presidential history, said Douglas Brinkley, a presidential historian at Rice University. "We make a big deal that Harry Truman told off a newspaper critic for writing a bad review of his daughter's music concert," he said. "How G-rated is that compared to what Donald Trump has done?" Dozens of lawmakers from both parties, activists, political pundits and others rushed to condemn the president's comments. Sen. Susan Collins, R-Maine, tweeted: "This has to stop - we all have a job - 3 branches of gov't and media. We don't have to get along, but we must show respect and civility." The tweets also came up in news conferences and interviews on Capitol Hill, where most lawmakers would have much rather discussed immigration and health-care legislation. "Obviously, I don't see that as an appropriate comment," House Speaker Paul Ryan, R-Wis., said during a news conference. "What we're trying to do around here is improve the civility and tone of the debate, and this obviously does not do that." Nicolle Wallace, an MSNBC host who was George W. Bush's communications chief, used her Thursday afternoon show to urge women working in the White House to "go on the record and condemn your boss's comments." She challenged the women who are defending Trump and asked how mothers can raise their sons to be "good men if the most powerful man in the world gets away with this." "As someone who once proudly called myself a Republican, the party will be permanently associated with misogyny if leaders don't step up and demand a retraction," Wallace said. Laura Ingraham, the conservative commentator who has considered working in Trump's administration, tweeted: "MESSAGE DISCIPLINE!" She added that the White House should have spent Thursday focused on two immigration-related bills that passed in the House and "not cable TV hosts." Bill O'Reilly, a former Fox News personality and a longtime friend of Trump, said on Ingraham's radio show that the president is undermining his own message. "It's kind of discouraging for Americans who want important things to get done to be sidetracked by something like this," he said. The president claimed in his tweets that Brzezinski and Scarborough tried to spend time with him at his Mar-a-Lago resort in Palm Beach, Fla., over three days around New Year's Eve. The two were spotted by journalists at Trump's New Year's Eve party at the private club, and Scarborough said at the time that they were there to set up an interview with the president-elect. A routine-looking photo of Brzezinski from that night circulated on Twitter on Thursday showing her smiling broadly. The president's tweet was reminiscent of other comments that he made about women on the campaign trail - including his rival, Democratic nominee Hillary Clinton, whom he accused of not looking presidential and lacking the "stamina" needed for the job. He made fun of GOP rival Carly Fiorina's face; tweeted a side-by-side comparison of his wife and the wife of then-rival Sen. Ted Cruz, R-Texas; and lashed out at Megyn Kelly of Fox News, saying that she had "blood coming out of her whatever" as she questioned him about comments he had made about women during a debate. Since becoming president, Trump has also continued to call Sen. Elizabeth Warren, D-Mass. "Pocahontas" in mocking a controversy over her ancestry. Although Trump has boasted about the level of support he has received from female voters, he is much more popular among men. Many of the protests during his presidency have been led by women, including hundreds of thousands who rallied in cities around the world the day after his inauguration for the Women's March. For Republicans who opposed Trump during the campaign, the episode has felt like a sickening moment of "I told you so," Mair said. "Personally, that's a pretty demoralizing feeling," Mair said. "A lot of people hoped that things would be different once he got into the office, but the guy's been on this earth for seven decades. You can't really change his behavior after all that." As of Thursday evening, Trump's wife and daughters had not publicly reacted. Stephanie Grisham, a spokeswoman for the first lady, referred reporters to comments that Melania Trump made on the campaign trail about her husband needing to defend himself. At an April 2016 rally in Milwaukee, she said: "When you attack him, he will punch back 10 times harder. No matter who you are, a man or a woman, he treats everyone equal." Scottie Nell Hughes was among the few female defenders to appear on national television in October after The Washington Post unearthed an "Access Hollywood" video that featured Donald Trump bragging about groping women without their permission. Hughes said Thursday that it is "definitely a struggle" for his supporters to defend him in such cases. "I personally would never attack a woman and her looks, and I don't like that at all," said Hughes, who is now the spokeswoman for a pro-Trump political action committee, the Committee to Defend the President. "But America wanted a fighter, and that's why we elected him, he's fighting back - not exactly how I would choose to do it, but he's defending himself." The Post's Paul Farhi contributed to this report.